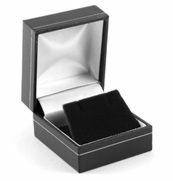 Black Earring or Ear Studs Leatherette Gift Display Packaging Boxes. 50mm x 30mm high x 45mm dimensions. Satin internal trim finish with velour black earring stud pad insert. Leather type finish Black earring gift box. Excellent quality Ear Stud packaging box in Black colour with Gold banding. Velour earring type display insert pad and box internal white trim.